This construction video will provide step-by-step instructions on how to estimate cutting length of rectangular stirrups. The sample drawing of a beam is presented with X = 300 mm and Y = 400 mm. 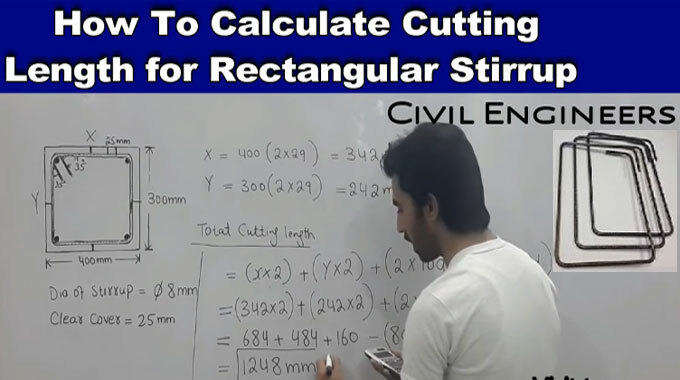 Now, find out the cutting length of rectangular stirrups. Stirrups are considered as the vital part of the reinforcement. Actually, Beams & columns are imperfect devoid of stirrups. Stirrup belongs to a ring that ties the bars jointly. The ring ranges from square, rectangular or circular on the basis of the geometry of the beam or column. Beams are commonly rectangular while columns are square, rectangular or circular. Stirrups are utilized in the beam or columns to manage the transverse shear. Transverse shear is vertical in beams and therefore the stirrups arranged are vertical. In columns, the Transverse shear is Horizontal and therefor the stirrups arranged are Horizontal.